Here's a little treat for you today. Literally. I was searching the internets a few weeks ago and came across a candy made from hop oils. Of course I tweeted about it, duh. The next day, the guy who makes the candy sent me an email and told me some of the history behind the candy and what flavors I might expect, should I accept his offer of samples. 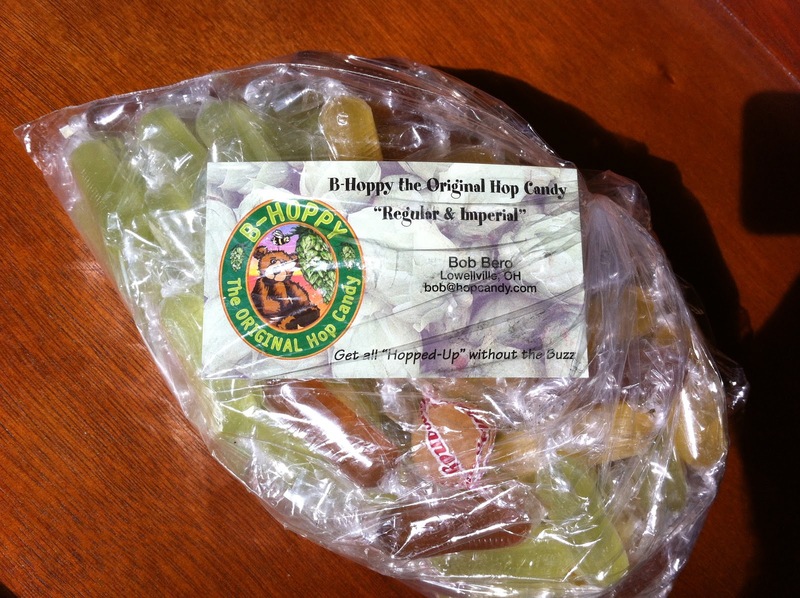 Well, a few days later, a box of candy arrived: B-Hoppy candy in three different hop varieties, each distinguished by a distinct color. I started with the Cascade hop variety because I thought I might like it best. Sweet and not bitter in the slightest, yet you still feel like you're tasting that hoppy flavor you know so well from beer. Because you are! But the complete lack of bitterness was notable. The flavors are flowery and oily, perhaps lightly citric. There are many flavor subtleties that come together to make one really interesting and enjoyable whole. The aftertaste is pleasant and lasting. Bob from B-Hoppy said he originally got the idea for making these while drying some of his home-grown hops. Something about the linalool aroma being a lightbulb above his head. I moved on to the East Kent Golding hop candy next. Perhaps it was fruitier or juicier but basically seemed the same. And finally, I tried the Saaz variety. Also very similar with just a hint of herbal flavors and a touch more spice. The uniqueness factor is high. They are probably not the candy of choice for the PTA meeting or your child custody hearing, but you won't get drunk sucking on them even while you're working. Finally, for you people that care about nutrition... In each serving (3 pieces): 70 calories, 0g fat; 0mg sodium 17g carbohydrates; 12g sugars; 0g protein. So if you're doing the math, I consumed 140 calories for this post. And I'd do it again too!